The 89th Airlift Wing based at Andrews AFB, District of Colombia has six C-32As (B-757) assigned in the executive transport role. 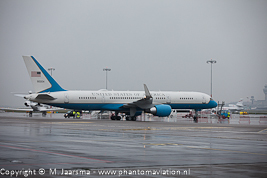 C-32s don't visit The Netherlands often. On this occasion it brought General Joseph F. Dunford, Jr. the 19th Chairman of the Joint Chiefs of Staff and the highest ranking officer of the USA to The Hague. In the ministry of defence General Dunford was appointed Commandeur in de Orde van Oranje Nassau met de zwaarden (Commander in the Order of Orange Nassau with the swords) by Dutch minister of defence Ank Bijleveld-Schouten. 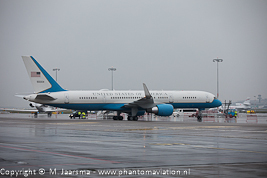 Arrival of the C-32A at Schiphol East where it was parked during the visit.